I’ve been carrying my camera with me every where I go. No, I am not committing to taking a photo a day, but somehow having photos to talk about helps me get past writer’s block. I have photos, therefore I will blog. What decided me were the mushrooms. I think it was a Monday. We went on our walk as usual (my Bud & I) and there were mushrooms popping up everywhere in the grass around the ponds and buildings of the business park where we work. And I had no camera! I decided to take it to work on Tuesday. And guess what? The landscapers came before 8AM and mowed down all the mushrooms! Talk about a lost opportunity. I knew then that I should just have the camera with me, just in case I saw something worth taking a photo of or blogging about. A week has passed, we’ve had some warm rains, and the mushrooms popped back up. This time I had my camera. Good thing, too, because this morning the landscapers mowed everything down again. Pretty cool ‘shrooms! I should have located some faeries to put in there, but I think this time I will let the ‘shrooms speak for themselves. It isn’t just the size of the mushrooms, but the textures. These are some deliciously textured mushrooms! 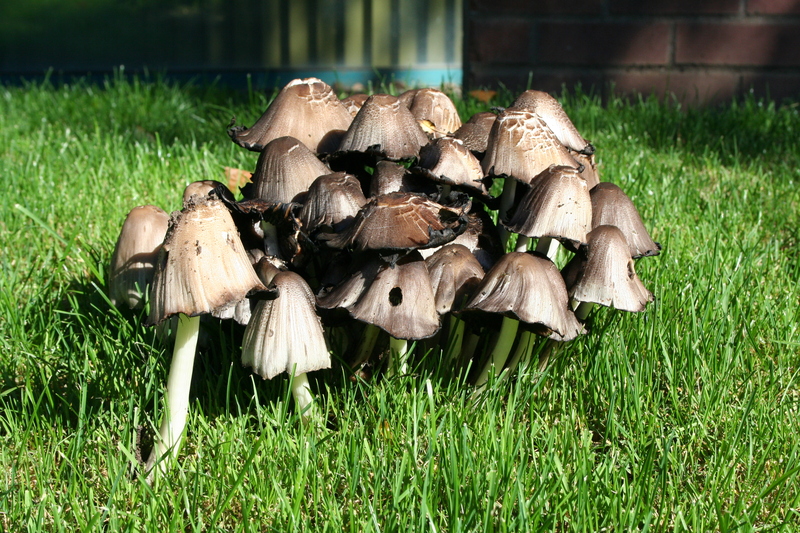 I think these are a fresher version of what is pictured above and they look similar to “Shaggy Mane”. They aren’t “Shaggy Manes” at all (they’re too smooth) but they do seem to turn “inky” rather quickly, hence my observation. 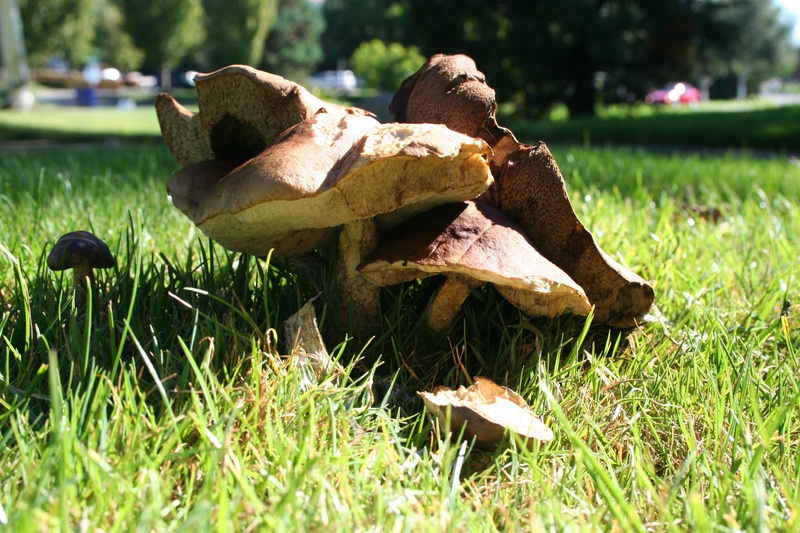 I automatically assume any mushroom growing in a public place like a lawn is either poisonous or hallucinogenic (I did not photograph the psilocybin that was rampant in the lawn after the landscapers mowed last week). There is a way to find out if a ‘shroom is edible or poisonous, but it takes time and a good reference book (or website). 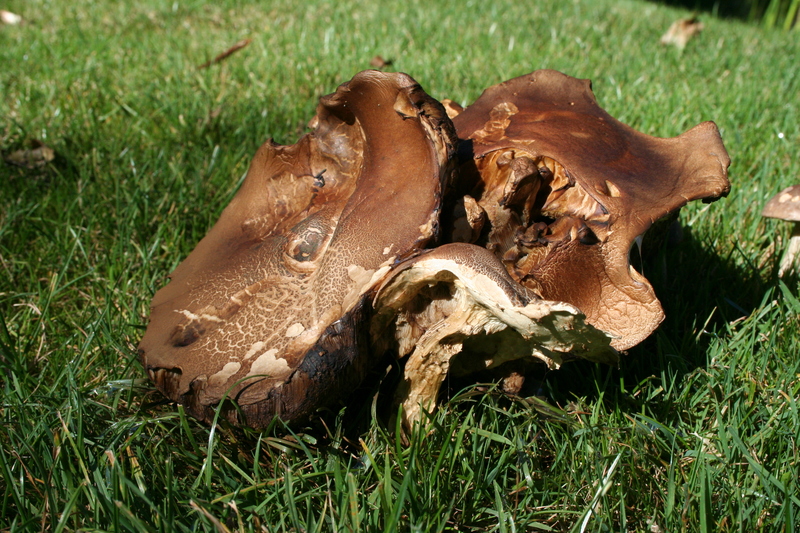 Edible Wild Mushrooms is a great website (which I just found). I love how the warnings pop up (two of them) and the last word is “when in doubt, throw the mushroom out!” And wash your hands. 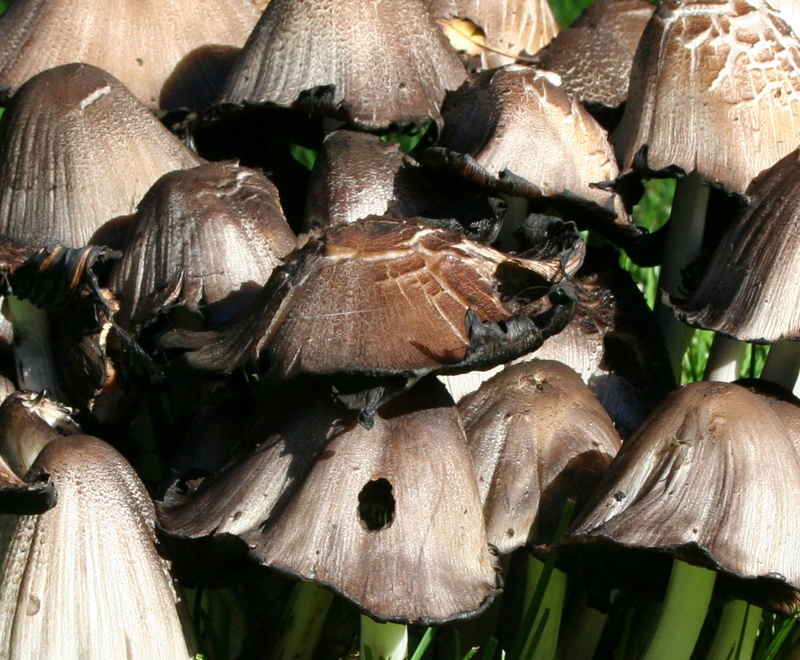 Even edible mushrooms can make you ill. I once picked a passle of Shaggy Manes and fried them up for supper. Some of them must have been just past “edible” because i got a little sick. Well, a lot sick, but not death-bed sick. 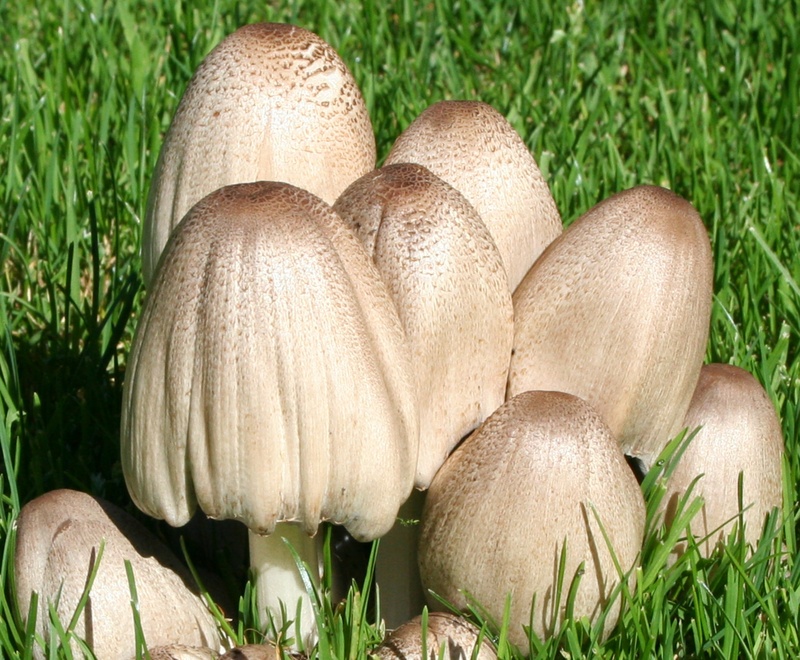 I probably will never eat a Shaggy Mane again, and they are pretty yummy. *IF* you pick them and fry them when they are very, very VERY fresh. I remember the first time I went ‘shrooming with my husband’s family. My own family never did anything like that (we weren’t big mushroom eaters). I called my folks to tell them about hunting for wild morels and I got a lecture on being Very Careful. That carries over into mushrooming: find something suspicious? He has to take the time to key it out and identify it and label it. We never try something we are not absolutely certain of. If he read my blog, he’d tell me exactly what mushrooms I took photos of and he’d have ten cows because I labeled one photo “toadstools”. True story. 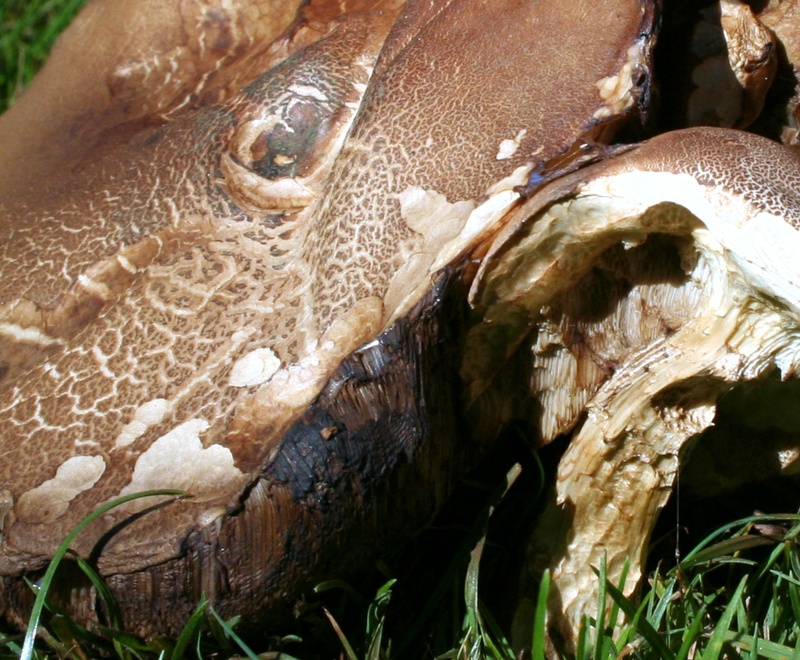 There are no “toadstools” – they have scientific names. Just like there are no sea gulls. They have a specific name. I agree with Donald. I like being corrected if I’m wrong. Let’s get it right. The fungus photos are wonderful. Still laughing about Don and the bird names…….So true.